The room was modern and well built, with a terrific view. The Owner Eva was really nice to us. She helped us with our laundry and surprised us with a delicious self baked cake. Absolutely exceptional location, with an extraordinary view of the bay from the terrace ! 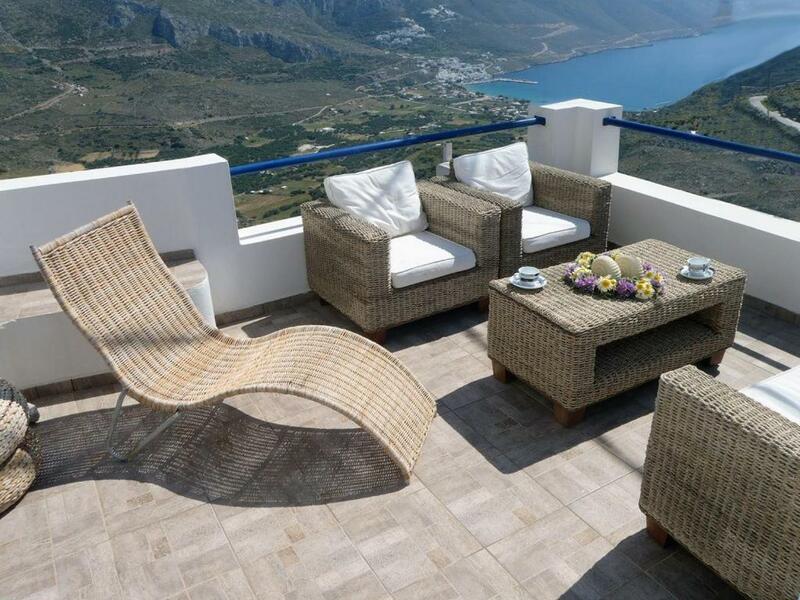 The property is located in an authentic charming village in altitude, with good facilities. The studio itself is very pleasant, and its friendly and kind hostess also. Calm setting, spacious & clean room with excellent view of the egiali gulf. Fully equipped room provided everything needed. Quiet area within Tholaria village, great views and super clean & spacious room!!! La vue de la terrasse est incroyable et l'équipement de la cuisine est très complet. L'emplacement exceptionnel avec une superbe vue sur la mer de la terrasse. La décoration de l'appartement simple et agréable. La vue est magnifique et être au coeur d’un village authentique où les ânes servent encore quotidiennement et font partie du charme et de la vie des habitants est un moyen formidable pour séjourner sur Aegiali. Bonne situation pour randonner sur les sentiers numérotés de l’île surtout le numéro 4 qui relie le village à l’autre de la vallée. L’hôte est très serviable. Par dessus tout l'accueil d'Eva la propriétaire, très chaleureuse. Elle habite à proximité et était aux petits soins pour nous guider dans la découverte de l'île. La situation est idéale, village authentique, au calme, avec de délicieuses tavernes. Lock in a great price for Plori Studios – rated 9.3 by recent guests! 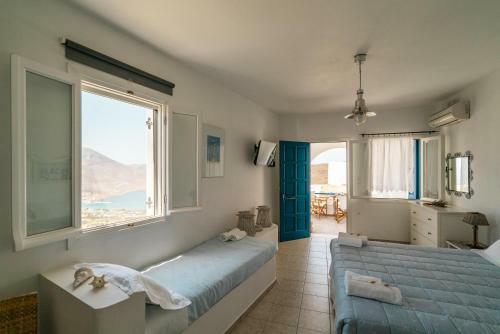 The Cycladic-style Plori Studios is located in charming Tholaria Village of Amorgos, just 1.9 mi from Aegiali. 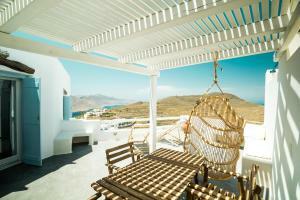 It offers self-catering accommodations with a balcony overlooking the Aegean Sea and the mountain. Free 2-way transfer from Aegiali Port is provided. 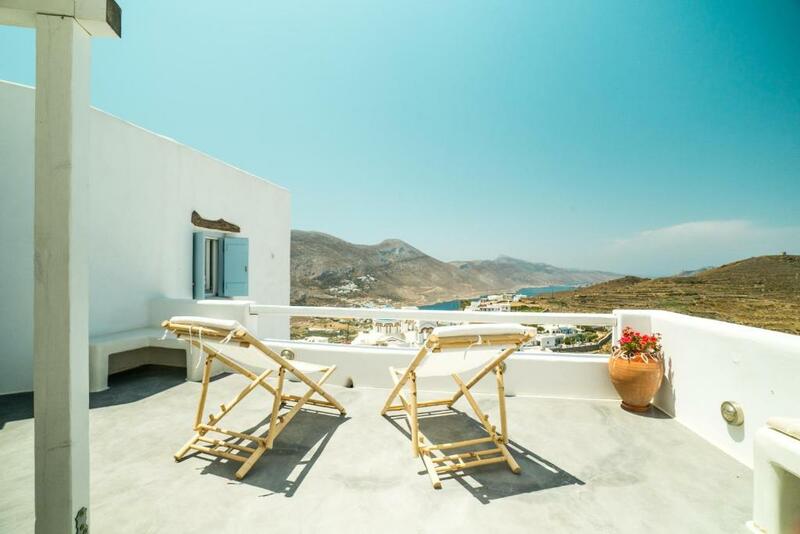 Offering free Wi-Fi or wired internet access, the air-conditioned studios and apartments of Plori are decorated with white painted furniture and bright colors. Each unit includes a seating area and a kitchenette with dining area. A fridge and a TV with DVD player are featured. The bathroom has a hairdryer and free toiletries. Traditional taverns and shops are within a 2-minute walk. Plori Studios is located 11 mi from the scenic capital of Amorgos and only 1.9 mi from Aegiali Port. A public bus stops 1,000 feet from the property, while the sandy Levrossos Beach is at 1.2 mi. Staff at the front desk can arrange car rental, while free parking is available 100 feet from the property. When would you like to stay at Plori Studios? Guests are offered a complimentary bottle of wine and fruits or local sweets upon arrival. House Rules Plori Studios takes special requests – add in the next step! Plori Studios accepts these cards and reserves the right to temporarily hold an amount prior to arrival. Please inform Plori Studios of your expected arrival time in advance. You can use the Special Requests box when booking, or contact the property directly using the contact details in your confirmation. Access to the property by car is difficult through a very narrow road, which would have been useful to know in advance! Parking is a little bit far from the studio. The prearranged taxi from Katapola port cost 60euro for a 45 min. drive shared with one other couple. Our portion was 30euro to be crammed into a car for that 45min ride. Exorbitant! And that was not even up to our studio. Eva met the taxi at the parking area in her little jeep and drove us up to the top. Eva took us to our 01:25 ferry in Aegiali port when we departed for no charge. A rental car during this season would be 25euro/day. Not a complaint, but good to know that this studio is about 150 steps up from the main parking/bus stop. Not a problem for us. I could have driven up the little road to the top, parked, and walked down just a few steps, but preferred to park at the bottom and walk. Good exercise! It's best to have a car especially off season when the bus schedule is minimal. Eva and our Plori Studio were exceptional! Our studio was at the top of Tholaria village in a very quiet area (it was off season, but even in season I expect it is quiet). The sounds were of goat's bells and the hooves of donkeys passing by on the steps through the village - no traffic noise at all. Sights were a dramatic view over the port and surrounding villages and mountains, donkeys stopping below our place to drink from a trough filled from a cistern every day by their owner. The studio was bright and airy with everything we needed. It was beautifully decorated, but not cluttered. Kitchenette was the best equipped that we've encountered. Beds comfy, loads of storage space for our stuff, both drawers and hanging. We sat outside most of the time but there is also a table and chairs inside. Plenty of electrical plugs, good shower, good WiFi... everything functional and easy for us. Best of all was Eva! She lived underneath and stopped by every day to check if we needed anything. Plus she brought us goodies from her kitchen every day. Stuffed tomatoes, cakes, homemade olives & bread, jams... even ran a load in her washer for us! We know she was also looking after other guests too. Eva is an teaches English, so zero communication problems for us. We look forward to returning next spring! What an amazing place, heaven on earth "everything was perfect". Both my wife and myself have travelled extensively throughout the Greek islands and it is a love affair that has lasted for over 30 years or more. We have always enjoyed the taste of real authentic Greek hospitality and have recently just returned from wonderful Amorgos. 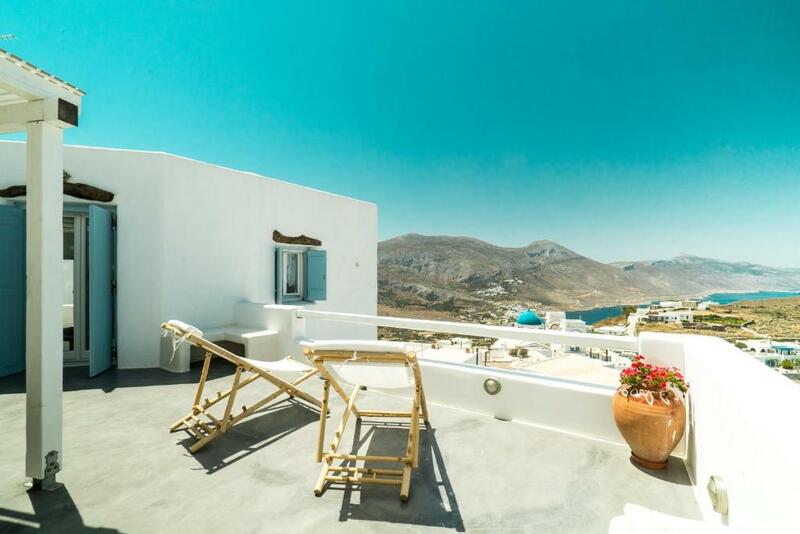 So if you're looking for real authenticity in an ever changing world certainly beautiful Amorgos, Tholaria and indeed Plori studios will not disappoint. For peace and tranquillity and sheer beauty you cannot miss this special place it is everything you could hope for and more. Plori Studios situated in the beautiful village of Tholaria host and owner Eva welcomes you to this magical place like a long lost friend with a smile that is instantly endearing. On our arrival Eva was at hand to meet us in the early hours and made us feel instantly at home. Eva insures your stay in unforgettable in every last detail for example, a welcoming gift of wine, water some fresh fruit, tea and coffee and of course delicious cake!! everything a weary traveller needs, thanks Eva. Eva is always on hand without been intrusive to offer advice and great insight on the local area and very helpful in suggesting places of interest to visit, a wonderful host!! 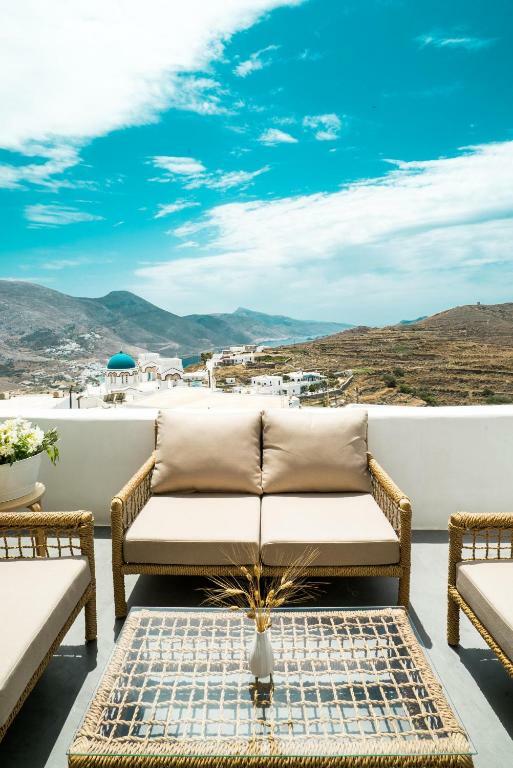 Plori studios are designed in the quintessential Cycladic style architecture you see in travel books, beautifully maintained and spotless with hanging plants that tastefully blend in with their natural surroundings. 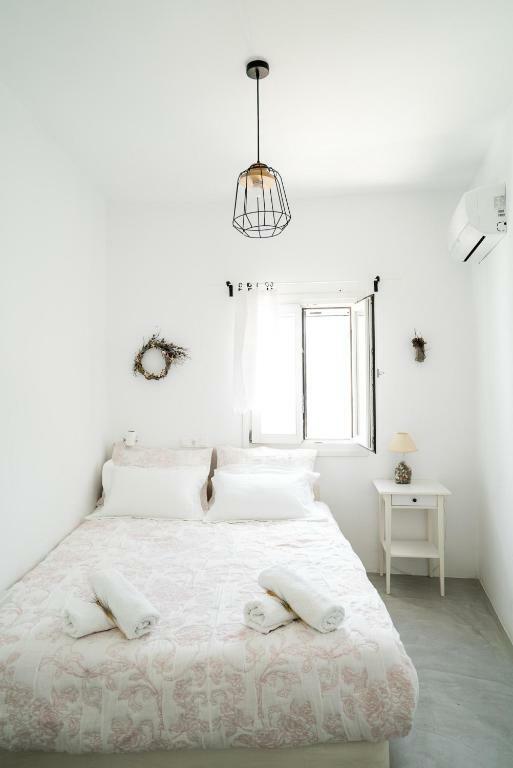 The interiors are extremely comfortable tastefully decorated in traditional yet contemporary cycladic style and offer affordable luxury with a personal touch. 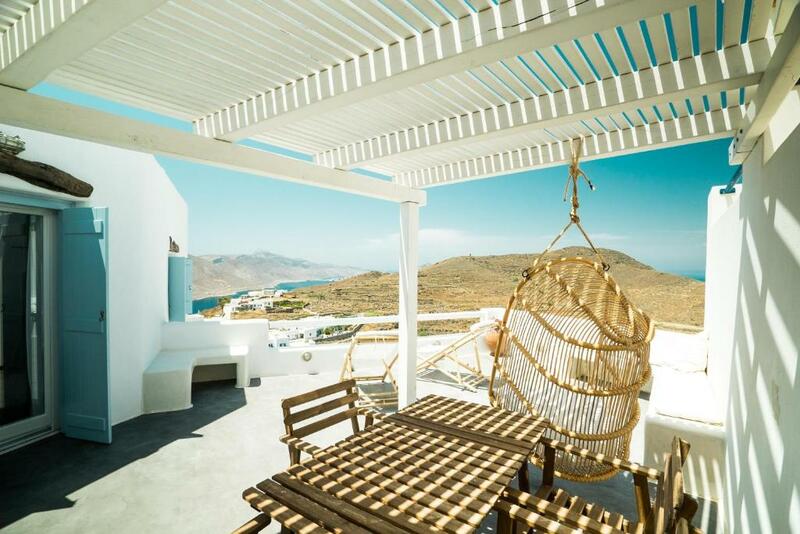 The view from our balcony was breathtaking, overlooking the Aegean, the village and beautiful countryside.